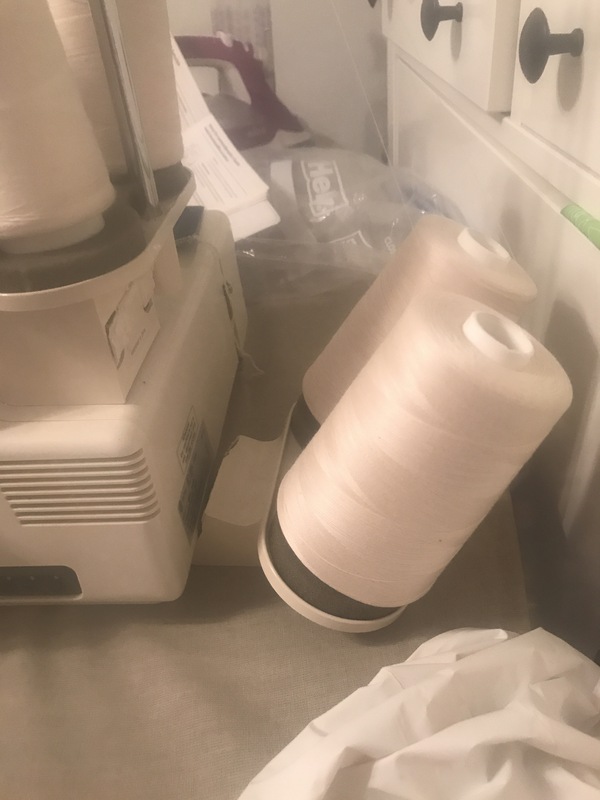 The other day I decided I wanted to look again for a used serger, just to look. Craigslist has never shown me anything particularly interesting, but I decided to try anyway. Lo and behold, there was a beauty at a pawn shop about half an hour from my house. Looked it up online and found that is had decent reviews, and decided to go “look” at it. Hubby was surprisingly supportive of this idea, even offered to drive with me. It was love at first sight, and (much like my cats) just had to come home with me. There she is, in all her glory. Unfortunately all was not unicorns and rainbows, due to an unfortunate accident while re packing in the store the rear thread holders broke off. Luckily our good friend has assured me that this is fixable. 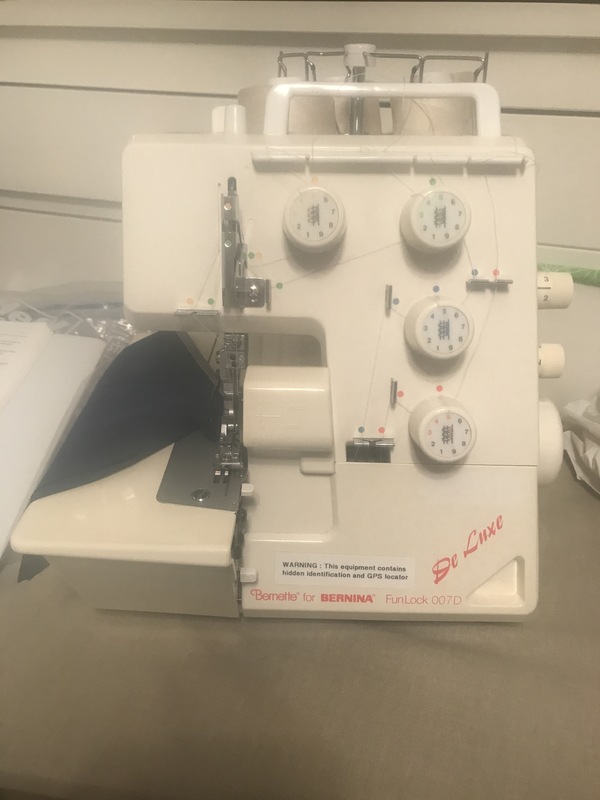 It hasn’t kept me from sewing though, thanks to Facebook groups I’ve been putting the threads in cups behind the machine. Works pretty well, but best believe that this Wednesday on grown up play date night I will be bringing it so he can fix it. First official serger garment, a Free spirit tank by patterns for pirates. I cut the handkerchief hemline and will say it’s not my favorite look. 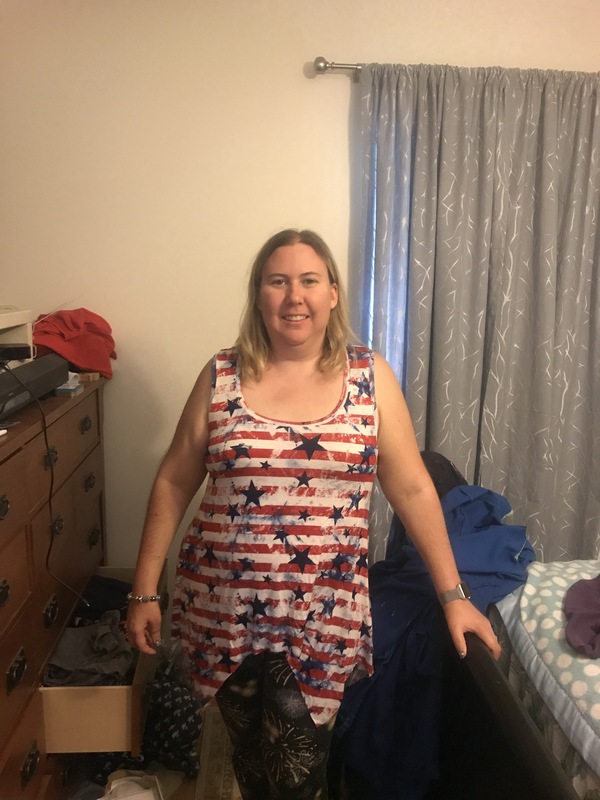 Next one will be the curved hemline, but this shirt is for the 4th, so I’m going to wear it come hell or high water. 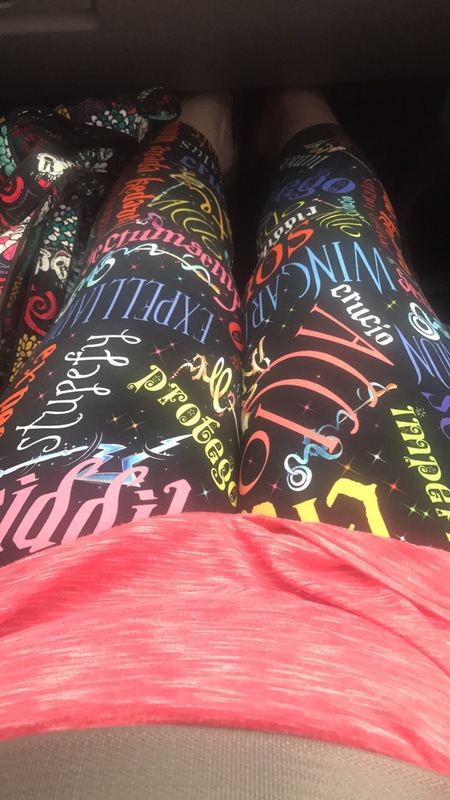 I also threw these Peg Legs together from fabric I got on a retail listing from Backstitch Fabrics. I cut and serged them in about 45 minutes, had to do the waistband in 2 pieces instead of 1 because I was running out of fabric. But they definitely work, and will be definitely be favorites. Conveniently they go perfectly with a shirt I already have! I finished another Me Matey muscle tank too, but don’t have a finished photo yet. Made it a size 7 to try and keep ahead of the incredible growing nephew. We’ll see if he likes it enough to wear it. I’m a little worried because the seams from serging are rougher than seams sewn on my sewing machine, and it’s color blocked on the chest. Guess we’ll find out Wednesday when I give it to him. Hoping to have a new dress done for his sister by then too, but I work the next 3 nights, so motivation might be minimal. Poor little niece hasn’t gotten anything made for her since a dress about 5 months ago. 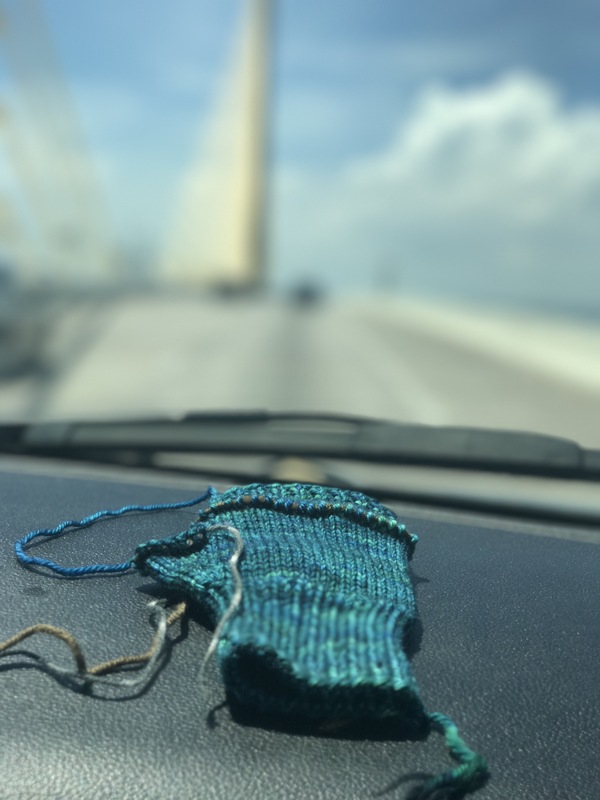 I leave you with a picture of my mitten I’m currently knitting enjoying the view from the top of the sunshine skyway bridge on our way at home from collecting my new pretty. Seems crazy to be knitting wool mittens when it’s over 90 outside, but hopefully they’ll come in handy come November when we visit northern Florida for 9 days. Next Post Happy (belated) 4th of July!